How do I get access to the free certification practice exam demo? 1. Sign in to www.erpprep.com (Registration and Login is required to access the personalized result book). 2. 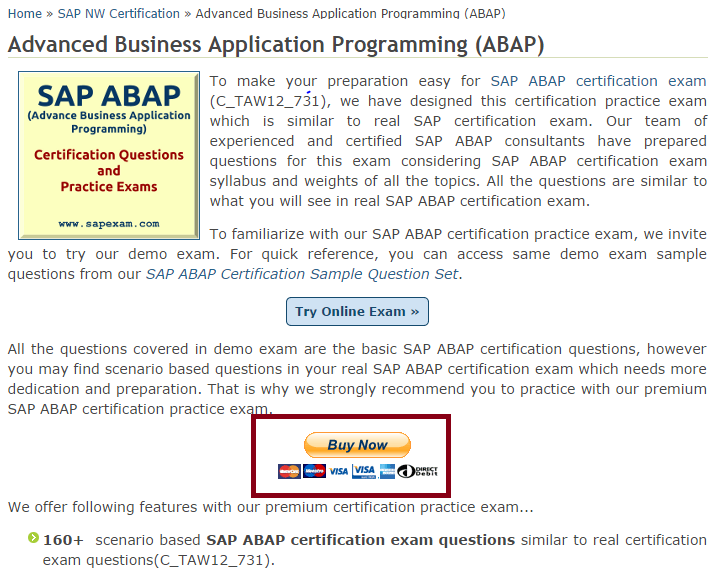 Click SAP Certification exam module page. 3. Click on "Try Online Exam" button. You will be redirected to the Demo certification practice exam page. 4. View the certification practice exam demo criteria. You will be asked to answer 10 different questions in the given time limit. 5. Click on "Start Exam" button to start the free certification exam demo. What is premium certification practice exam? Premium certification practice exam will get you an access to our premium platform with many other benefits. For more information, refer to the relative SAP Certification practice exam page. How do I get access to the premium certification practice exam? Follow the steps given below to access the premium certification practice exam. 2. Go to the SAP Certification exam module page which covers the certification exam you would like to attend. 3. You have to purchase a premium certification practice exam by following FAQ steps "How do I purchase premium certification practice exam?". 4. Once your order is placed successfully, we will review the order and provide premium certification practice exam access to your user account. 5. You will be able to access premium certification practice exam under "My Exams" section in user menu. We give guarantee to return your money back if you fail to clear the actual SAP Certification exam in the first attempt. Please visit our 100% Money Back Guarantee page for more details. 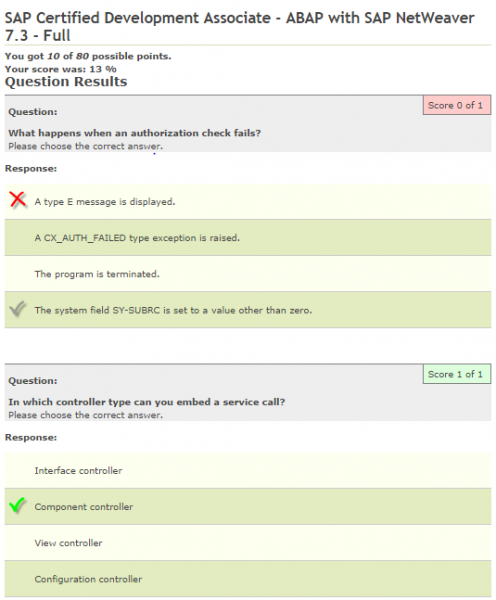 How do I report an error or mistake on any of your certification practice exams? 2. Question text or Page title where you found the error. 3. Your contact information, including your email address associated with your account. How Can I View the Result History and Review the Specific Exam Attempt Questions? How Frequently is Questions are Updated on Site? We do update our question bank regularly. Our experts keep our premium question bank updated based on latest exam pattern and type of questions asked in very recent actual certification exams. We always keep our self in touch with certified candidates in recent past to conduct an interview of their certification exam experience and questions appeared in real certification exam. Yes. SAP certification exams are not specific to any regions. This is why, any SAP exam will have same exam pattern with same questions set irrespective of region or location. For example, SAP FI certification exam conducted in UK and India will have same set of question. How do I make payment other then Paypal / 2Checkout? As Paypal and 2Checkout do not provide services in some countries, we have enable alternate payment method to purchase the premium practice exam on our site. Kindly refer given URL to make the payment for online SAP certification practice exam access. You will get detailed email once you are done with the payment. Step 1: Go to relevant product page and read the practice exam features in detail and click on Buy Now button as given below. 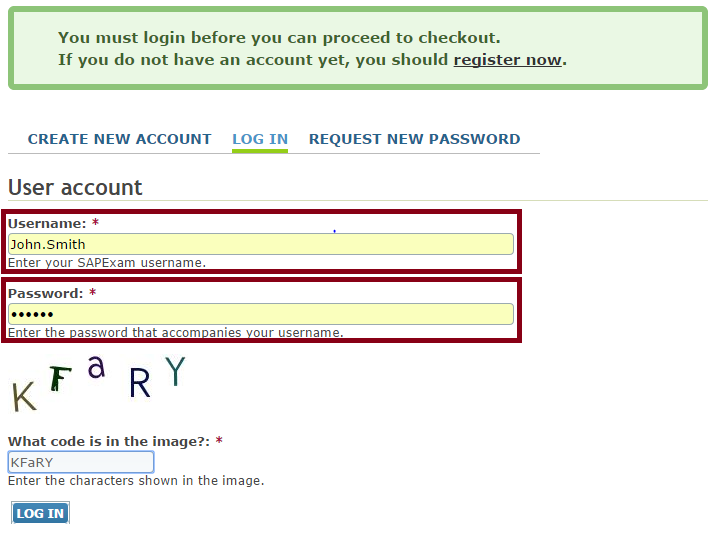 Step 4: Provide your user name and password to login or create new user to go ahead. Step 7: Make the payment on the payment page to complete this order (Our payment gateway accepts payment through Credit Card, Debit Card, and Paypal). Step 8: Our support team will process your order after reviewing the payment status. 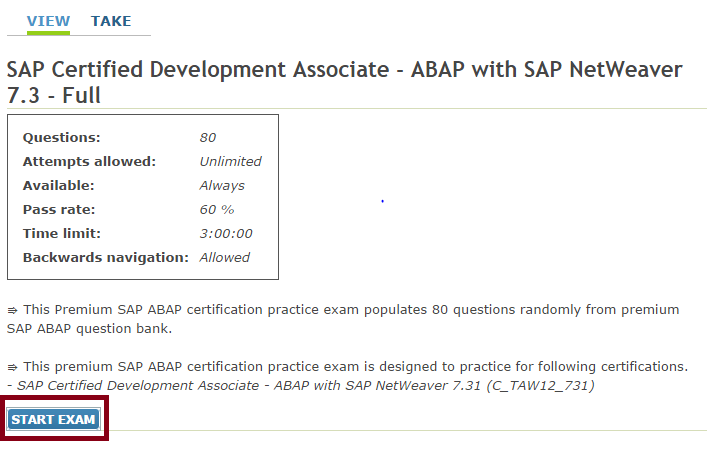 Step 9: To access the online premium practice exam for SAP certification, click on My Premium Exams as shown in below screen. Why am I getting "Authorization Failed: Do Not Honor" error? Reason for the message: The information passes validation on 2CheckOut end and an actual authorization request is sent but the bank is declining the authorization. The most common cause for this error is that the seller is located outside of the country that the bank is located in so it is showing up as an international transaction. How to resolve the issue: Contact the bank and let them know that you want the transaction to go through (they will be able to see the authorization attempts) and then replace the order. If they still receive problems then their purchase session is probably locked because of previous declines. They must wait 30 minutes, use a different browser or clear their cookies and restart their browser so that a new purchase session is used when they replace the order. How do I purchase premium certification practice exam? Follow the steps given below to purchase the premium certification practice exam. 2. Open the SAP Certification exam module page which covers the certification exam you would like to attend. 3. Click on "Buy Now" button to open product page. 4. Click on "Add To Cart" button to add the product to your shopping cart. 5. Click on "Checkout" button to proceed for the purchase. 6. Fill all your order details carefully (as you need to provide documents with same details for Money Back Guarantee) and click on "Review Order" button. 7. Review your order details and click on "Submit Order" button to make the payment. 8. Make the payment on the 2Checkout payment page to complete this order (2Checkout payment gateway accepts payment through Credit Card, Debit Card and Paypal). 9. You will be redirected back to www.erpprep.com on order details page. 10. Now you are all set to start practicing with premium practice exam under "<User Menu> → My Premium Exams"
Where do I find my premium certification practice exam after I have made my purchase? 2. 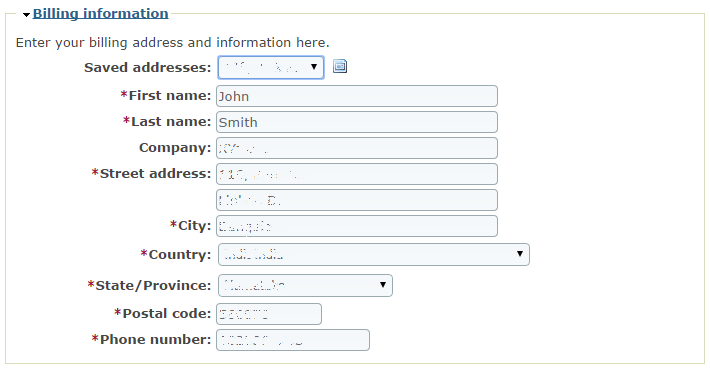 Sign in to your Erpprep account with your user name and password. You will receive an immediate email confirmation re-stating the order details and welcoming you to the site. The welcome and order confirmation email is the only receipt you will receive. You do however have access to previous invoices in My Account section which you can print on demand. You can continue to make your purchase using your credit card as normal and your financial institution/bank will make the conversion from your default currency to USD as per your bank's exchange rate on the day of the purchase. The ERPPREP.com web site will only display the USD price and will not display any other currencies or the current exchange rate. Your credit card or bank statement may show a different purchase amount based on your default currency and any fees that your bank charges you for a conversion. ERPPREP.com only charges you for the product you are purchasing. Erpprep.com does not charge you for currency conversions or exchange rate fees. The buyer is solely responsible for any associated bank fees relating to conversions and exchange rates. How secure is my personal information with ERPPREP.com? We do not store credit card or personal identification information on our servers beyond your email address and Erpprep.com account information. You can pay online using a credit card or debit card. We accept the following credit cards: Visa, Master Card, American Express, Maestro or Paypal. You can contact your local SAP Education organization to have it sent to you. Please note: Use of the SAP certification logo is strictly limited to those individuals who have successfully passed the associated level of certification. Unauthorized use of an SAP certification logo is strictly forbidden. After you successfully pass your certification exam, your certificate is sent to the address you entered during registration. You can expect to get the certificate about six weeks after your exam. 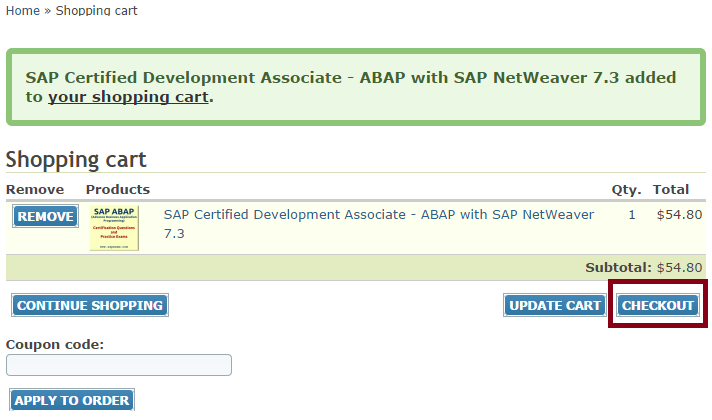 Do I need to enter my SAP user ID when registering for a SAP certification exam? Yes. To ensure that your certification results count and are tracked, you must enter your SAP user ID in the appropriate registration field. 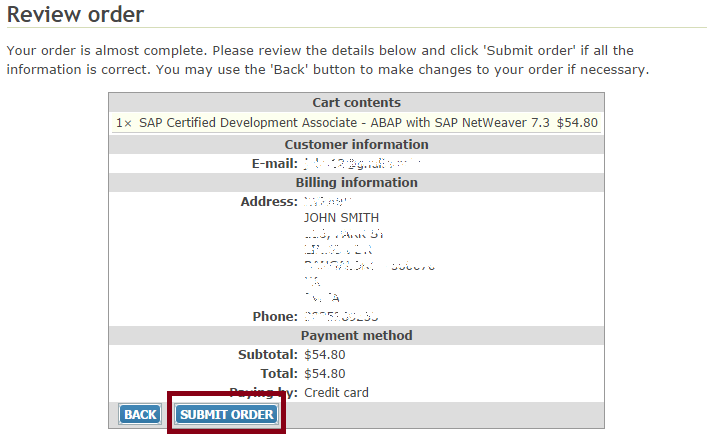 If you do not have a user ID, please contact your local SAP Education organization to obtain one. What methods of payment does Pearson VUE accept? Whether registering through the call center or online, you must use a credit card, voucher, or promo code to pay for the exam. How do I register to take an exam at a Pearson VUE test center? You can visit the Pearson VUE Web site to register for exams. The step-by-step registration process includes selection of location, exam type, date, and payment method. You can also use the SAP Partner Testing Centers link on the Certification options page of the Training and Certification Shop to look for testing options available through Pearson VUE, or you can contact your local SAP Education organization. No. Certification exams are the same no matter where you take them. SAP has partnered with Pearson VUE to provide our customers with the greatest possible number of exam locations. You can take certification exams at SAP Education organization centers as well as at any of the 4,500 Pearson VUE centers worldwide. How can I prepare for my SAP certification exam? Each SAP certification exam has its own set of preparation strategies. We refer to them as “Topic Areas” under “certification details” and you can find them on the Web pages associated with individual exams. The pages also show the number of questions in the exam, the duration of the exam, the areas you will be tested on, the required passing score, and recommended course work and content you can reference. You can also find a selection of sample questions that can help you to better understand the type of questions to expect in the exam. Please be aware that the professional-level certifications also require several years of practical on-the-job experience and address real-life scenarios. For more information, refer to five simple steps for preparing for an exam. Is certification is served based on available role profiles? Yes. The present certification programs address a variety of profiles. These contain proficient technology consultants, application consultants, and solution architects in multi tier certification tracks, as well as roles involved in all stages of a solution lifecycle. The present tactic focuses on making additional importance for you as a certified individual. SAP offers you the chance to join the newest certification community, providing access to a extensive range of assistance. Fulfilling a desire expressed by current consultants, the SAP Education organization also plans clear paths for nonstop learning. These include fast-track learning paths to help you advance in your current area of expertise or extend your expertise across new areas. Existing certifications retain their validity. What qualities which actually measured by SAP Certification Exam? Candidates can apply one’s knowledge and skills gained by learning and training. Apart from this, certification exam measures candidates’ expert skills which is gained by experience while working with project implementation. Which actually required appropriate and focused domain area of SAP application. What are prerequisites of SAP Certification programs? While there is no course or set of courses required to take a specific certification exam. SAP provides a list of recommended training you can take to better prepare for an exam. In addition, completing an exam for a lower-level (associate) certification is not a prerequisite for taking a higher-level (professional) exam, although many professional-level certification seekers might find it helpful. In India, candidates without any SAP experience need to attend mandatory training program followed by certification exam. Certification is an critical way to standard your professional attainments in a competitive, dynamic market, so it’s significant to make sure your certification authorizations are up-to-date. How Worth is SAP Certification? SAP has meaningfully improved and stretched the certification program to manage pace with rising request for applicable SAP certification exam. Now, you can get SAP certifications exam with two levels of capability – associate and professional. We’ve also prepared it easier to find the certification that’s right for you. You can now search for training opportunities and exams based on the SAP solution, your focus area, or your role in the organization by visiting the Training and Certification Shop.